Fatigue and stuffiness led to an inappropriately Deep Thought. And so I was struck by the fact that all of us has a bond that is unstated, obvious, and yet incredibly relevant: We’re all alive right now. We’re the people who lived through the end of the 20th Century and the beginning of the 21st. Not just the people in the conference room, but every single one of us. Despite all our differences, we share one huge bond: we are the people who are alive right now, right this very moment. We weren’t in the past, and we won’t be at some indeterminate point in the future, but right now we are all living in the world. I walked back upstairs after the meeting and almost immediately got the news that Steve Jobs was gone from that world. When I got back here in 1997, I was looking for more room, and I found an archive of old Macs and other stuff. I said, ‘Get it away!’ and I shipped all that s—- off to Stanford. If you look backward in this business, you’ll be crushed. You have to look forward. I didn’t know Steve Jobs. Most of us didn’t. I interacted with him a few times, asking a few press-conference questions, interviewing him on the phone once. But like the rest of you, I felt some sort of strange connection with him. He was the face of the company I’ve covered for coming up on 20 years. His return to Apple saved it from oblivion. And then we got the world-changing products: Not just the Mac, which had redefined what a “personal computer” was in the ’80s, but the iPod, the iPhone, and the iPad. Steve Jobs didn’t invent those products singlehandedly in his garage, legends be damned. There are hundreds of brilliant people at Apple who deserve the credit for making the company’s incredibly popular products. But Steve Jobs was the guy who created the environment those products were built in. He’s the one who prodded the people at Apple to make their prototypes better. He made Apple what it is. What the company does from here on out, it does because of him. Steve Jobs was diagnosed with pancreatic cancer in October 2003. He had surgery in 2004, and later a liver transplant. Everyone at Apple has a lot of time to prepare for this day. It still comes as a shock—though Steve’s resignation in August was a clear warning sign—but at least the moment has been prepared for. No company is truly ever ready for the loss of its founder, leader, and spiritual guide. And filling a void left by Steve Jobs will be one of the most difficult tasks ever. But if there’s ever a company that’s had time to reflect on how to maintain that leader’s legacy and way of thinking, it’s Apple. The company set up Apple University as a way to preserve Apple’s corporate culture in a post-Steve world. Today’s Apple is the company that Steve Jobs built after his return in 1997. The executives are people who worked with him. For the past few years they have all been aware, as has Jobs, that the company would outlast him. Will they succeed? There’s no way to answer that question. Apple’s riding as high as almost any company ever has. There will be stumbles—but there would’ve been stumbles with Jobs in charge, too. (Jobs’s track record contains an insane amount of hits, but also a few misses.) But still, there has never been a company better prepared for a loss like this. This is legendary stuff. I’m still trying to process it, to give it some time and not just start chanting santo subito, but it’s hard not to look at that list and imagine that Steve Jobs will go down in the history of business and industry as a legendary figure like Thomas Edison or Henry Ford. That those of us who are lucky enough to grow old and rickety (in a way that, cruelly, Steven Paul Jobs was never allowed to) will say that we saw that man stand upon a stage with a giant Apple logo behind him and introduce a new iconic, world-changing product. In a hundred years, perhaps he will have been reduced to a caricature. History does that. Maybe he’ll be seen as some genius inventor who created the first computers in his garage. It won’t be an accurate image, necessarily, when seen through the mists of time. But I have a hard time thinking he won’t be remembered. But the biggest thing about iPod is that it holds a thousand songs. My daughter was born in the interregnum between the announcement of the iPod and its release to the general public. Those of us who were fortunate enough to attend the Apple event introducing the iPod got to take review units home, running beta software and pre-loaded with music. As my wife labored to bring my daughter into the world, she did so with music playing. It was a special playlist she had built in iTunes. This is not special now. This is part of the fabric of our lives. You make a playlist and then play it back. At a birth, or a birthday party, or some other social event. But back then nobody had iPods yet. Nobody except people from Apple and a few members of the media. I might have been one of the first people to have an indelible personal moment happen to the soundtrack of an iPod, but hundreds of millions more would follow. The world before the iPod, when Apple was just a computer company, seems so long ago. My daughter turns ten next month. The most one-on-one time I spent with Steve Jobs was a telephone interview for the 20th anniversary of the Mac and Macworld in 2004. We spent six months setting up what ended up being about a 10-minute-long phone call, if that. My last question to him was—and this was just after the “interim CEO” days—how long he felt he’d stay at Apple. He paused to contemplate for a minute. Then said, and I’m paraphrasing here, “Well, you know what the song says. We’re all just renting time here on planet Earth.” His tone seemed very different from the rest of the interview, and I actually appreciated that he was so philosophical about it. Who can say what the future holds? A while later it came out that my conversation with him took place in the period just after he had received his first cancer diagnosis, but before he had decided to get treatment. It all made a bit more sense then. Steve Jobs could have left Apple at any point after his cancer diagnosis. He had enough money to buy one of those private islands that only rock stars and James Bond villains can afford. That he didn’t, even after living (briefly) with a death sentence before it was transmuted into a future of struggling with cancer, tells you something about his passion. Apple was his passion. Not just the company that he founded and then rescued, but what Apple represented. Apple as an engine that took the highest technology the human race had yet invented and turned it into products that people would buy, use, and love. 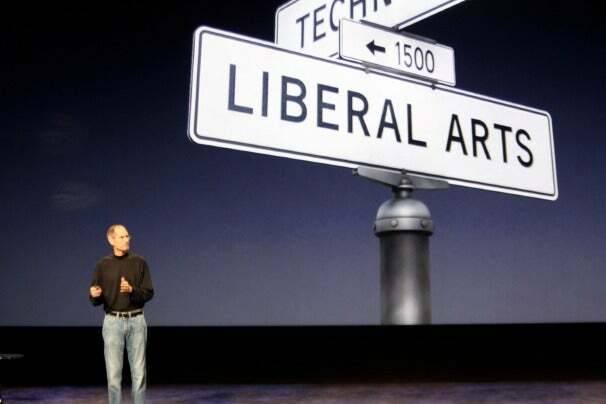 It’s telling that at numerous Apple events, Jobs would cart out his street-sign slide, the one that indicated that although Apple’s address was 1 Infinite Loop, the company’s heart was firmly planted at the intersection of Technology and Liberal Arts. Here’s the thing about Steve Jobs: If we were writing about his life in 1987, or 1997, or even 2002, the story would be very different. In those days Apple was an outlier, an oddball company that made weird, incompatible products used only by a small number of people. Jobs would have been notable, especially for the Apple II and the Mac, but a lot of the story would have been how Apple lost the PC-industry battle to Microsoft Windows. Look at Apple today. It’s one of the most valuable companies in the world. Apple isn’t a weird brand anymore, it’s among the most recognizable brands in existence. Its stores are perhaps the most profitable retail outlets in the world. The Mac is more successful than it’s ever been, but even PC users have embraced the iPod, iPhone, and iPad. Old rival Microsoft spent a decade trying to explain to people why they’d want a tablet PC with no success. In a single shot Apple introduced the iPad, redefined the category, and created a hit product. That’s the story of the last ten years of Steve Jobs’s life. In that ten years, he took Apple from being an oddity to being as mainstream as it gets. The philosophy that failed Apple in the PC industry of the ’80s and ’90s turned out to be a winning philosophy in the digital-appliance era of the 2000s. It might not have looked like it in 2001, but in 2011 it’s clear. This is not the story of a talented but under-appreciated man whose products were influential while his company flailed and failed while others made billions on his good ideas. This is a story of victory. In the end, the world embraced Apple. It embraced Steve Jobs. And the world’s a better place because he was in it. Now we have to move on without him. But I feel lucky that, for four decades, we were both alive. And my life is better for it—as is yours. Thank you, Steve, and goodbye. You made more than a few dents in the universe.